The launch of the XV takes Subaru into the compact crossover segment for the first time, where combining style with functionality is key. In this highly competitive segment, the XV will offer something different, and will bring a new level of engineering excellence. In the XV, Subaru has achieved its aim of providing a stylish and distinctive crossover with trademark Subaru driving dynamics, but combined with high level of functionality and fuel efficiency. Door opening dimensions which have been enlarged and a seating position which allows much easier ingress and egress. Large Multi-Function Display (MFD) which is highly visible in the upper middle section of the instrument panel for comfortable driving. Subaru's designers worked hard on the XV's interior to bring out the best qualities of the chosen materials and to give passengers a feeling of quality as well as spaciousness. � An upmarket interior was created by balancing and combining the different tactile and emotional qualities of leather, metal, and cloth. A heavily revised version of Subaru's Boxer Diesel, which was specially developed for the European market, is also featured in the XV line-up. 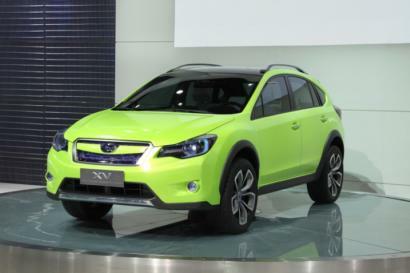 Making use of the inherent advantages of Chain-driven CVT (Continuously Variable Transmission) such as lightness, compactness, superior fuel efficiency and wide ratio coverage, Subaru successfully developed a new CVT for the XV for improved environmental friendliness and drivability. Fuel efficiency will be further improved through Subaru's advanced new stop-start system which features a newly developed 'change of mind control' function to enable smooth restart within only 0.2 seconds of stopping. A number of key features will take the XV to top of the class for safety. By integrating the partition windows into the front doors and positioning the door mirrors on the door panels, class-leading forward visibility was achieved, and blind spots reduced. A stylish profile with a more streamlined rear roof edge was designed without impairing the rear field of view. In addition to SRS driver's/passenger's airbags, SRS side airbags and SRS curtain airbags, SRS driver's knee airbag are installed as standard in all models.